Smoke Chasing Grand Tour 2012 (SCGT12) is proud to be a sanctioned AMA National Grand Tour and a featured Team Strange Airheads™ GT once again. This is a self-paced BBQ/”Smoke” Grand Tour that combines your love of motorcycling and great food. SCGT12 is a perfect complement to your day trips, weekend rides, team rides, club rider events, and can easily be part of your long distance adventures and rallies. SCGT12 is open to all makes and models of motorcycle and all types of riders. Proceeds from this event will once again benefit Eddie’s Road, a charitable foundation dedicated to changing the lives of abused and neglected children. I’ve signed up for the tour and am rider #127. You can see the pics of the places I’ve visited in the Ride Reports section of this blog. Two years ago while on a trip with friends riding down the Blue Ridge Parkway we were all stopped by police as we exited the parkway headed into Cherokee, NC. The Police where only stopping motorcyclists and as we later found out there was a big motorcycle event in the town of Cherokee. At the time it was annoying. As we talked later that night around the campfire we all felt that this treatment was a bit unreasonable as a way to check on the riders attending the event, which we were not. I didn’t think much more about it until I got home and looked up more information on Motorcycle-only Checkpoints. I was upset with what I found. The National Highway Traffic Safety Administration (NHTSA) made available to state law enforcement a grant to be used to setup motorcycle-only checkpoints. 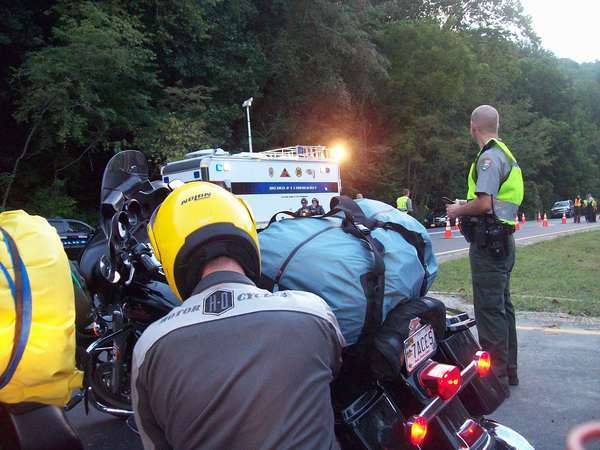 Under its Motorcycle Law Enforcement Demonstration grant program, the NHTSA awarded up to $350,000 in total to be divided among as many as five law enforcement agencies to set up traffic checkpoints that target motorcyclists. This money was put into place in Florida, Georgia, North Caroline, and Virginia among others. The demonstration program was to be modeled after a controversial program in New York where the state police set up a series of checkpoints that targeted only motorcyclists, raising the ire of the AMA and motorcycling community. 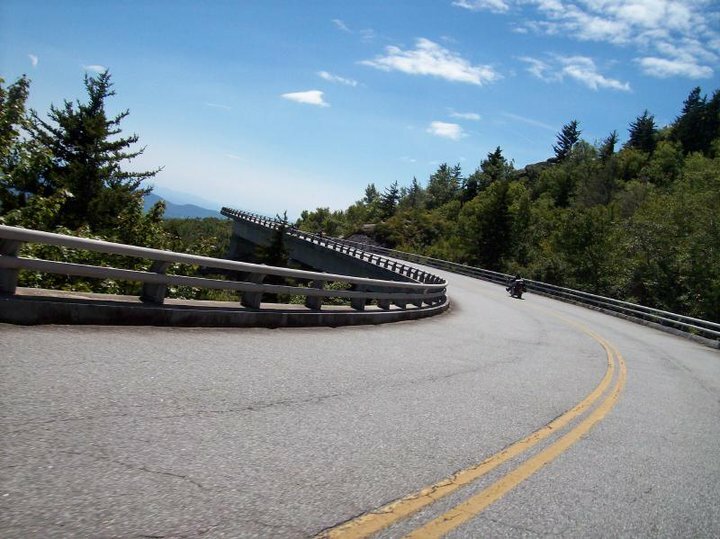 In 2008, for example, New York State Police announced plans to set up 15 checkpoints near motorcycling events that summer. In February 2011 the AMA urged riders nationwide to contact Georgia Gov. Nathan Deal of Georgia to stop the Georgia State Patrol from conducting any motorcycle-only traffic checkpoints.The NHTSA gave Georgia a $70,000 grant to conduct one or more roadside motorcycle-only checkpoints. In May of 2011 the AMA expressed their concern to Gov. Bob McDonnell over a recent motorcycle-only checkpoint in northern Virginia during Rolling Thunder. Being a resident of Virginia I contacted my delegate and expressed my concern of the discriminatory use of these checkpoints. On Feb. 28, 2012 Virginia Gov. Bob McDonnell signed into law H.B. 187, which was introduced by Delegate C. Todd Gilbert (R-Shenandoah). The new law, which takes effect July 1, prohibits law enforcement agencies from establishing checkpoints where the only vehicles subject to inspection are motorcycles.I also revived a personal letter from my delegate in response to my concern for this issue. Similar laws have now been enacted in New Hampshire and North Carolina. On March 3 2011, Rep. Jim Sensenbrenner (R-Wis.) introduced bill H.R. 904 into Congress. The legislation, with original co-sponsors Reps. Tom Petri (R-Wis.) and Paul Ryan (R-Wis.), would prohibit the DOT “from providing grants or any funds to a state, county, town, or township, Indian tribe, municipal or other local government to be used for any program to check helmet usage or create checkpoints for a motorcycle driver or passenger.” This bill was wrapped into H.R 7, the “American Energy and Infrastructure Jobs Act of 2012.” H.R 7 was passed by the House on Feb 7th and has moved to the Senate. if you have been subjected to a motorcycle-only checkpoint in your state I implore that you reach out and contact your local, state and federal elected officials and bring this issue to their attention. Go to http://www.americanmotorcyclist.com/rights/issueslegislation and select the Support federal legislation to prohibit the funding of discriminatory motorcycle-only checkpoints option on the page. When I was in High School I was a sprinter and ran relay races on the track team. My coach said “Track is an individual sport performed with others.” I was recently thinking about how much this also applies to riding. Whether I’m riding to work, with a group, or on my own I’m never truly alone on the road. To ride a motorcycle is to ride alone with others. We’ve all heard the phrase “Ride your own ride.” What does that really mean? For me, it goes to the heart of riding alone with others. There are always other cars and bikes sharing the road with me. The key is to ride to the level I’m comfortable with and not to exceed my skill level. If I’m riding with a group I make sure I’m going at a pace that is comfortable and safe for me. This may mean I need to change where I am in the line up. I’ve realized it’s not a sign of weakness to move to the back of the line if I am feeling pressure to go faster than I’m comfortable with. It’s also not rude for me to move up the line if I’m frustrated riding behind slower riders. Having the correct pacing for a ride goes a long way to enjoying that ride. If the group is too slow or too fast I’m not going to have a good time. On group rides, especially with new groups, it is hard to know what the group dynamic will be or what kind of riders will be participating. To solve that question in the group I ride with we have implemented riding levels we assign to each ride. This lets people know what they can expect before they even show up. We have a Pace level and a Difficulty level. The Pace Level is how fast the ride is. Level 1 is a relaxed ride where the group will stay in tighter formation. This pace caters to those wanting to take a more leisurely ride. Pace Level 2 is slightly more aggressive where every rider at least keeps the motorcycle behind them in their mirrors. Pace Level 3 is the most aggressive with a see-you-at-the-next-intersection pace. Difficulty levels range from Easy for straight roads with long sweepers to Hard (i.e. Tail of the Dragon-ish). With this system no one is surprised by the pace and difficulty of the ride they show up for. I try to remember that I ride with a group for the social stops and camaraderie, but the ride belongs to me. It’s nobody else’s fault if I have a bad ride but mine. If I’m riding with a few friends I try to not get caught up in trying to keep up. I hear more stories of accidents where a less experienced rider was trying to keep up with a more experienced rider. The result is almost always an accident or a close call for the less experienced rider. Riding with a more experienced rider is a good way to learn from that rider, but it’s important to know where the line is between trying new techniques and pushing too far too fast. If I’m commuting it means choosing a route that is going to get me to work safely. This may mean avoiding highways if I’m not comfortable sharing the road with that many other drivers. If I’m on a solo ride it means being aware of how traffic is moving around me and keeping my bike in a place that will keep me safe. When I ride to work or solo I use the ride rating system mentioned earlier. It helps me mentally prepare for the ride I’m about to take. Thinking through the route and what I expect to find gives me a mental image of how I need to ride and puts me in the right frame of mind. I call it putting on my mental armor. I go through the ride in my head while I’m putting on my real armor. No matter how you look at it, operating a motorcycle is completely in the hands of the person holding the handlebars. 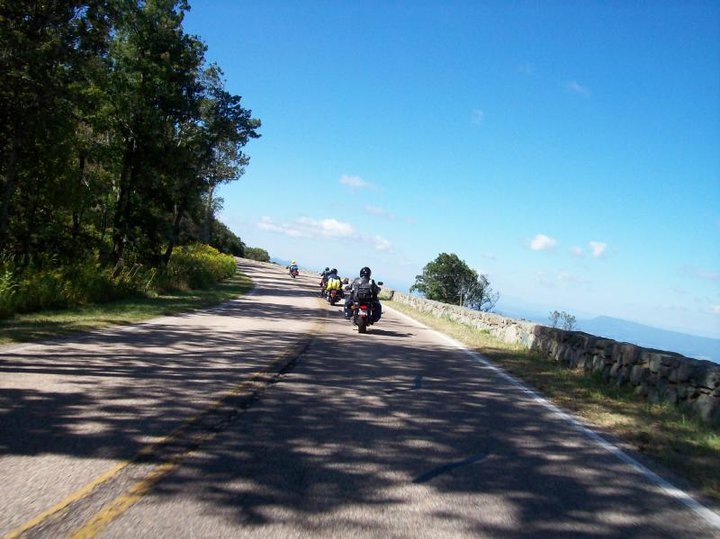 We are, however, constantly being acted upon and interacting with other riders or drivers while on the road. Ride your own ride, be safe, and enjoy riding alone with others.